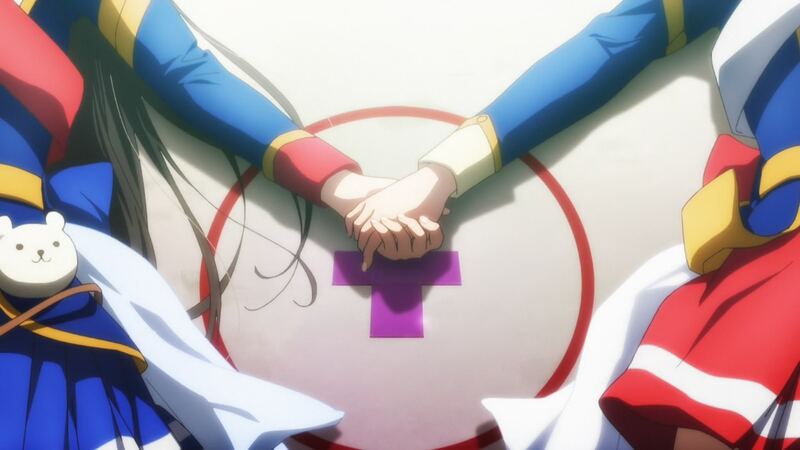 ─ For all the adversities the main duo has to face by the end of the series, Claudine might very well be the most tragic character in the entirety of Revue Starlight. Alongside Tendou Maya, she represents the faction that attempts to conquer the system from within, and that’s not the best stance to take in a show which made it clear since the start that it wanted to reject the status quo. And unlike her partner, Claudine’s in a situation where her dream of being the top star is inherently impossible within the current structure. All she’s got is the certainty that her rival would never lose to anyone else before she’s ready to beat her… and then they go and get defeated by the obstinate main characters. Though the outcome isn’t fatal, since Tendou Maya rejects the possibility of this being the end and promises to aim towards new heights alongside her, Claudine’s been in a painful position throughout. She deserves all the shipping fanart she’s getting, that she would pretend to not care about while she maintains a huge hidden folder full of it. Both members of the YUTO HAMA DESIGN Office have been sharing many of their contributions to the series, which have really helped establish its unique visual identity – from the most iconic imagery to these giraffe-themed bentos and snacks for the audience in this episode. 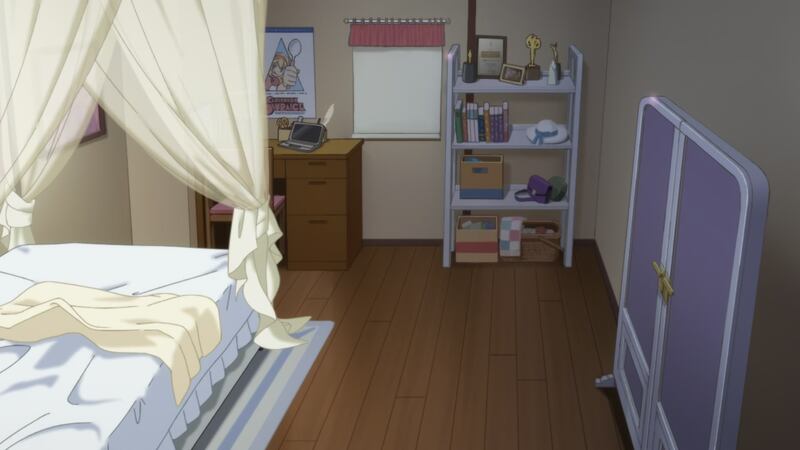 Unfortunately, we didn’t get to see their amusing Clockwork Omurice poster in its full glory. ─ While technically this was meant to be Claudine’s chance in the spotlight, much of it is actually spent drawing parallels between the two duos, highlighting the opposite ideologies they represent but also the important memories they both share. Although that’s used to striking effect here and there, episode 10 lacks the cohesiveness that made previous outings feel so poignant; I get the feeling that the episode was meant to be entrusted to Yuka Kuroda for the most part, but considering the state of the production at this point, it’s no surprise that they needed up to 6 various directorial roles just to get things done. The result isn’t poor by any stretch, and yet you can tell that it went through too many hands to fit together perfectly. The major exception to this was the revue duet, storyboarded once again by Takushi Koide. As a two-on-two match meant to put its emphasis on how much stronger both couples become when working together, Koide concentrated all his efforts on the fighting choreography. If sheer aesthetic punch is what you want from these confrontations then Fumiaki Kouta might have beaten everyone with episode 8, but the enchanting flow of Koide’s work can’t be matched by anyone else. Giving him so much authority over the revues despite being a newbie when the project started was a very smart move. ─ Unfortunately, living up to Koide’s ambition became sort of impossible as the production advanced. Part of the confrontation in episode 10 fluctuates between static and rough, and that’s after Koide himself had already been forced to hold back to avoid wrecking his own team. Carrying out his will, even if compromised to a degree, would have been impossible without people like Natsuho Iwaida, who animated most of the revue this time. 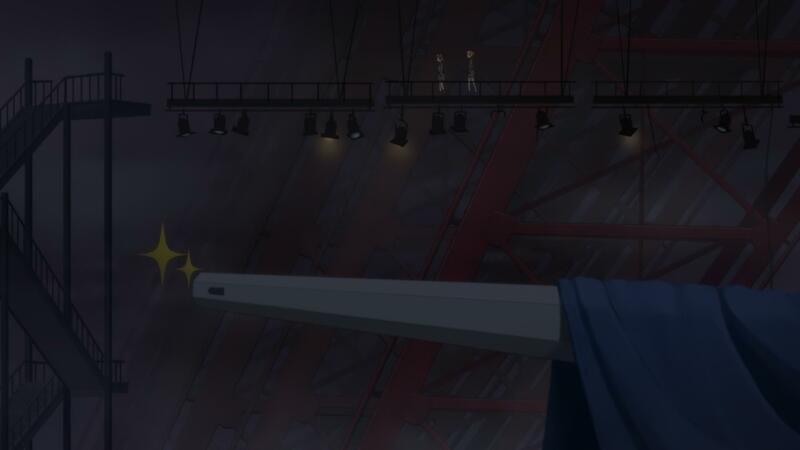 Iwaida is still a bit of a newcomer, a Silver Link-trained youngster who happens to love Revue Starlight more than anyone else – as you can tell by her passionate speeches about the series and the fact that she’s drawn more not-really-fanart than the rest of the internet put together. That incessant gushing on social media became slightly suspicious, as everyone knew she was working on the show and yet it took her 8 episodes to be credited at all, and for relatively minor tasks at that. The answer turned out to be simple: Iwaida handled a big chunk of climactic work on episode 10, and not content with that, she reappeared in every episode until the end. This was a lot to ask from someone in her position, but the result was more than satisfactory. It’s people like her that kept this show afloat. ─ Since I’ve gone and talked about a particular animator, let me follow up on something that I’d already mentioned before. This was one of the episodes where western artists had a notable presence; from Joao‘s cute moment that defines the relationship between the two leads to Spike’s literal rise and fall, they all listened to the staff’s pleas for help and came to play an important role. And yet it’s something else that I wanted to talk about: Franziska Van Wulfen‘s first professional work. Part of it is that I want to stress out that just by being there and allowing Kinema’s team to allocate any work to people outside the overworked main crew they already helped a huge amount, even if a scene appears to be less important, but I also wanted to mention that the experience she went through is sort of common. Part of her roughs were discarded, sort of nerfing the sequence in the final product. This kind of incident tends to affect newcomers, especially enthusiastic overseas animators who aren’t acclimated to the environment. At first glance it seems puzzling – why get rid of outstanding cuts that have already been done? The truth is that even if the brunt of the work, a sequence still needs to go through the hands of many people before being finished, and if it turned out to be a more ambitious effort than initially envisioned then things might begin crumbling. Now there’s no doubt they could have finished her work as it was, but small moments like this can quickly pile up so the management staff tend to be very wary when the situation is already dangerous, even at the cost of some quality. A learning experience I’m sure, and at least we got some hypnotizing baton animation out of it. ─ To the surprise of no one, the red herring of Hikari’s betrayal that the whole show toyed with turned out to be a selfless act to protect everyone else and Karen in particular. Knowing first hand what happens to the losers who are robbed of their brilliance by the system, Hikari sacrifices herself so that no one has to go through that again. Talk about predictable backfiring! Though Karen’s dreams aren’t magically stolen in the same way, the effect in the end is essentially the same, since Hikari was the person who made her chase that goal in the first place. 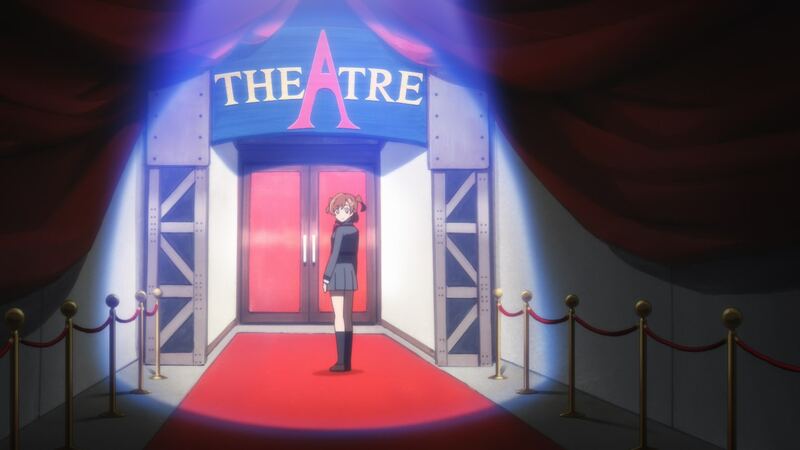 The script and Shouji Saeki‘s storyboard put emphasis on that by having Karen come to that realization in the same way Hikari did: mid-performance, lowering her arm before finally breaking down. But if there’s something that defines her, thin as her character is, it’s obstinacy. Returning to the play’s original text that she can barely read and grabbing onto the line that states that a character is imprisoned rather than falling into nothingness as her one source of hope feels like a very Karen thing to do. Her final, crowbar-wielding act of defiance towards the system is quite the cathartic moment, even if you’re not all that sold in the relationship between the two. ─ The ruthlessness with which times accelerates for Karen and the audience when Hikari disappears is one of the most impressive achievements of this episode, but the interlude leading to the finale has to be the excerpt of the storyboard that left the strongest impression. Karen descending the stairs alongside her companions, traversing props that represent their character and role in the story, is one of those moments that sticks with you – even more so if you’re as much of a sucker for camaraderie as I am. It feels like a very satisfying screw you from the whole cast to the system that actively pitched them against each other. Onto the grand finale we go. ─ And grand it is. Since sometimes I’m more curious than I should be, I went and asked a certain person in the team what Revue Starlight‘s last episode would be like. The answer I got was “BIG”, which turned out to be metaphorically but also literally true. 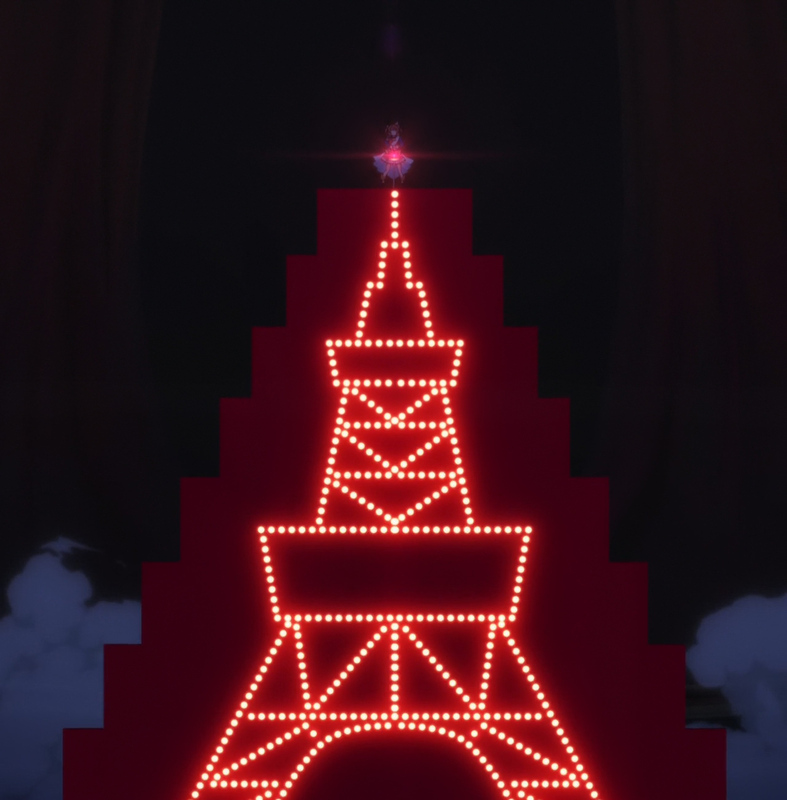 Delivering your feelings and a rejection of the tragic ending implicit in the current system via a 333 meter tall tower that represents your promise is as large as it gets. It’s also very straightforward for a series that early on could have fooled you into believing it’d be a complex allegorical piece that you’d struggle to decipher. 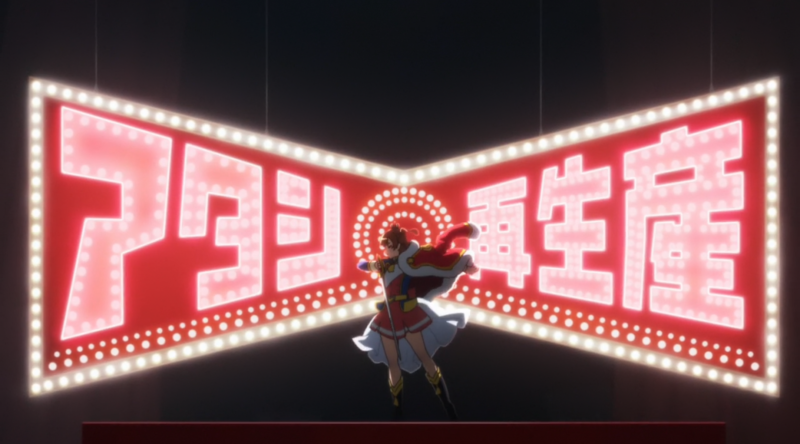 I consider its bold, direct approach to be a virtue, but at the same time, I consider the complaints that the Revue Starlight was lacking in character (especially when it comes to Karen) to be entirely fair. Tomohiro Furukawa‘s first major role was co-directing Yurikuma Arashi, a show that sacrificed many opportunities to individually develop its cast in favor of strengthening its thematic backbone, to support a final, larger message that hit hard. 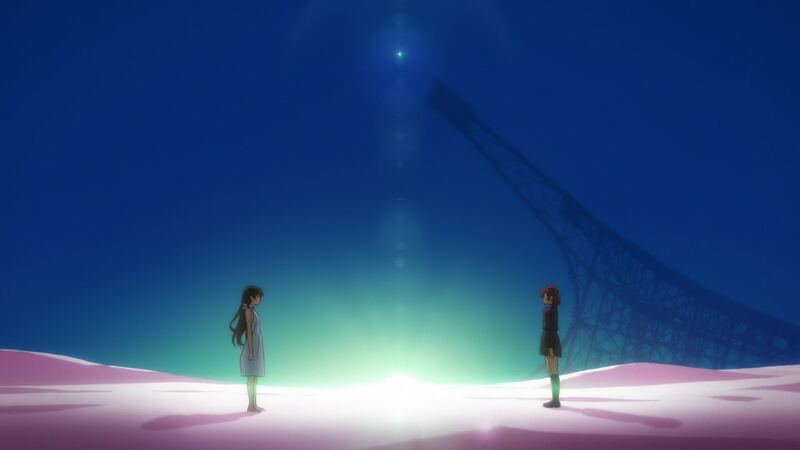 Now, the first project he led had thinner characterization for its main characters than some viewers desired. Instead it focused on a narrower but still strong message, delivered with more pizzaz for the most part. However you feel about that will depend on your priorities when it comes to the media you consume and the expectations you had for Revue Starlight to begin with. Considering I was screaming just as much as the goddamn giraffe – which ironically was meant to embody the insatiable audience, complicit in the suffering of the girls – you can guess which camp I was in. 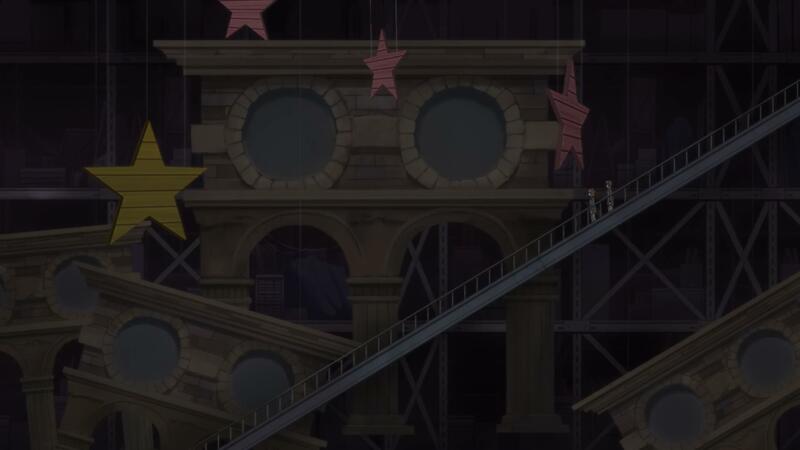 The invoice confirmation Studio Pablo received for their work on Revue Starlight‘s background art. Wakarimasu. 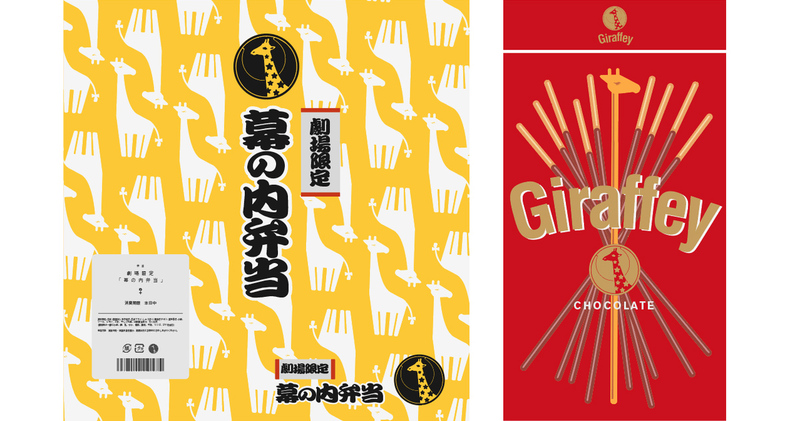 ─ The actual giraffe elephant in the room, however, is the production struggles and outright staff exhaustion. Since not everyone seems to grasp what that really entailed, I have to point out again that this doesn’t mean the show started looking rough. To be honest, if you’re not attuned to these matters you might have barely noticed the downward trend. Does that mean that it wasn’t that bad after all? Absolutely not. Chief animation director Hiroyuki Saita‘s first words after the finale (which was only finished the previous day) were that it was a series of miracles that they had finished at all. The exact same thoughts were echoed by main animator Kaito Shimizu, one of the many members of the core team with dozens upon dozens of credited appearances in a one cour production. Things got so bad that the staff had admitted they were forced to start scaling back their ideas somewhat, but that alone wouldn’t have taken them to the finish line were it not for Kinema Citrus’ capable and optimistic management staff, animators from in and out the country jumping in to the rescue, and maybe a few miracles as the people responsible have said. If children resemble their parents, it’s no wonder Karen and Hikari were so obstinate. ─ But let’s return to the final episode one last time, because despite those constraints, the team decided to go out with a bang. As much as possible anyway, since the result didn’t quite correspond to the astonishing list of key animators; the in-house stars were joined by the likes of the Yuyushiki duo of Kaori and Hisayuki Tabata, up-and-coming acting specialists like Khara-bred Jin Oyama, A-1 sphere people such as Maiko Kobayashi and Ken Takahashi, PineJam’s Kyouko Yufu, and so on. Considering the content of the episode, it’s no surprise that action and effects specialists like Toshiharu Sugie joined the fray as well. Even if the crew weren’t able to live up to their full potential due to the production’s circumstances, the episode managed to come across as a very satisfying realization of the directors’ ideas. Koide and Furukawa’s grand layouts were executed brilliantly, and the team still found some energy to animate the former’s tricky action sequences. And at this point, this is all we could ask for. ─ If I had to choose some animation highlights, I’d start with Satoshi Sakai‘s contribution. There’s something cruel to his crumbling effects and debris, especially once they repeat and you grasp the painful cycle that Hikari was stuck in, but at the same time he also handled a very hopeful sequence that opened up a door to her salvation. The action was in good hands as well; Grancrest‘s ace Hirotaka Tokuda kicked it off with neat sparks and pirouettes, but it was Fumiaki Kouta who made my jaw drop again with Hikari’s threaded dagger – putting his experience directing episode 8 to good use! 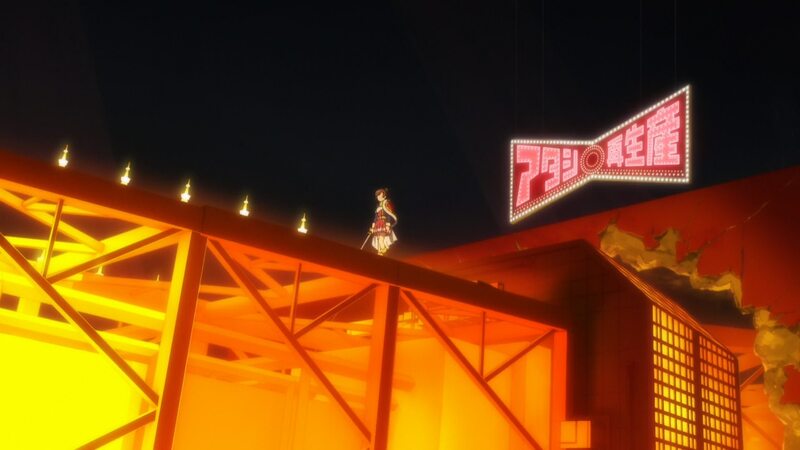 Karen skewering the stage with Tokyo Tower itself (Takashi Hashimoto‘s contribution?) is something I’ll never be able to forget, but the final piece of animation that will stick with me is the continuation of the cut we’d seen many times: the two hands reaching for the stars finally realizing that they were by their side all along. 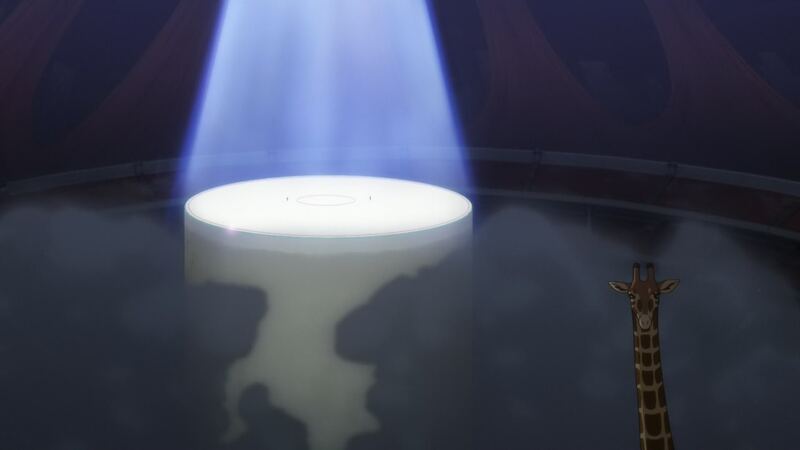 The only way Revue Starlight could end. Look at that lengthy staff list for every episode. How is this not a trainwreck? They are some of the more convoluted credits I’ve had to input here, which says a lot considering I’ve written at length about WIT shows. Considering they had an outsourcing firm like Lings help them out on the last couple episodes before the finale. It really is. Thank you so much for your reviews on this show! I fell in love with your blog after them. So glad to see a fellow portuguese make it in the anime industry.